OXFORD, Miss. 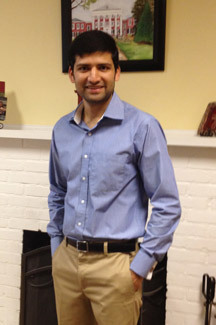 Vinayak “Vinny” Nahar, a University of Mississippi graduate student in the Department of Health, Exercise Science, & Recreation Management, has been named the School of Applied Sciences Student of the Month for April 2013. Dr. Nahar defended his M.S. in Health Promotion in April 2013, and anticipates completing his Ph.D. in Health Behavior and Promotion in 2014, also with HESRM. Dr. Nahar also holds a Doctor of Medicine from Vitebsk State Medical University in the Republic of Belarus. Dr. Nahar is the 2011 recipient of the H. Leon Garrett Achievement Award in Health Promotion, and also the recipient of First Prize in the University of Mississippi 2013 Graduate Student Council Poster Presentation.